Adonai can be translated as plural, implying the Triune God. Father, Son and Holy Spirit are recognized and then understood only from within, all intimate and personal. We cannot contain our God by knowledge, nor master the Trinity by comprehension. We can know Him only as He deigns to reveal Himself—Great One to lowly one. The Father initiates our wanting Him by the Holy Spirit’s brooding pursuit and the Father secures our access through the Son. The Trinity is my divine, unfolding adventure…and yours. By Light and not reason, He is seen. His mystery remains always a search without end, yet ever inviting us into a vision of His nature and being. So…there are His fascinating names. We follow the trail of those intricate names but we truly know God’s identities – wrapped in word-names – only as we experience the labyrinth of life with Him! 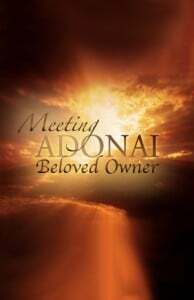 May we have eyes to SEE the Triune God whose Blessed Name is Adonai!